Emily Dickinson like you’ve never heard her before––poetry slam style! Come check out these free writing and performance workshops with Logan Phillips of the infamous Tucson Youth Poetry Slam (TYPS)! Open to all youth ages 13-19. Read more about the Big Read project at Zócalo Magazine. 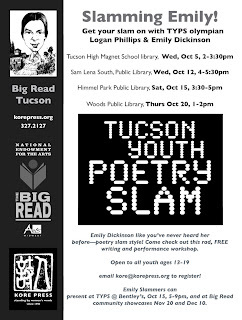 Brought to you by the NEA Big Read, Kore Press, and the Tucson Youth Poetry Slam.